Walk into any REI and you’re bound to be overwhelmed by the number of travel backpack options. Should I choose medium or large? Unisex or women’s? Blue or black? With so many choices, it’s no wonder travelers struggle to find the best backpack. The most important piece of travel gear. Here’s how to find the best backpack for you. “Backpacks have a gender?” you might ask. That answer is, sort of. Most major backpack brands have a least a few offerings designed for women’s frames. Your options in the world of backpacks are men’s, women’s, or unisex. The first step in choosing the best backpack is to decide whether the backpack “gender” is a factor you want to consider. For many shorter or more petite women, the design of women’s backpacks is more comfortable. Try a few on and see what makes sense for you. Besides going to a store you can also consider buying several backpacks and returning the ones that don’t fit since they have free shipping. Smell Proof Backpacks When Hiking With Kids. For an extended trip, you’re going to be hauling your travel backpack around for months. Do you really want that extra space, just in case? Be realistic about how much stuff you plan to bring, but know you’ll rarely regret packing light and a small backpack will help you achieve that. Hint: If you can’t get your gear-filled backpack on by yourself, you need a smaller backpack. For tips on lightening your load, read our Ultimate Guide to Packing Light. Along those same lines, consider the weight of your backpack. Backpacks have come a long way in the past few decades and most are fairly lightweight. That said, even one or two pounds will make a huge difference when you’re carrying your backpack for months on end. If you’re torn between two choices and one is a bit lighter, go with the lighter one as this will help you find the best backpack. Look at how the backpack is laid out. Is there only one opening at the top? Is that going to work for you, or would a front zipper be easier? Are there pockets that will make your water bottle and other frequently-used gear easily accessible? My favorite backpack has a number of very convenient pockets that make it perfect for extended travel. Sometimes the best backpack for the job depends on the destination. If you’re going to explore the plains of Kenya, you’ll probably choose a different backpack that if you were traveling around Northern Russia or Plan to Hike to Everest Base Camp. Think about where you’re going, what the climate will be like at that time of year, and how that will affect how you use your backpack. Daypacks — smaller, detachable backpacks or bags — can be great for people who pack light. You just zip off the top or front part of your backpack, and you’re off. But you definitely won’t blend into a metropolitan area carrying one of these. Determine whether you’d use a daypack and factor that into your search. 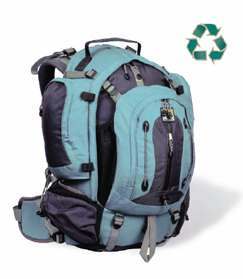 If you’re an environmentally friendly traveler, check out recycled travel backpacks. 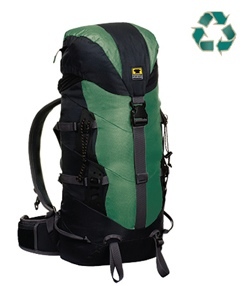 Mountainsmith has a good collection of quality backpacks made of recycled materials. With so many options available, there’s no excuse for buying a non-recycled backpack. Is your backpack’s sole purpose to get your gear from one hostel to the next? Or will you take it hiking and on overnight camping trips? Think about all of the ways you plan to use your backpack and make sure the model you choose is suitable for each use. Perhaps the most important factor of all — is your backpack comfortable? This means the shoulder, chest, and waist straps fit perfectly. It rests just right against your lower back. You don’t feel like you’re going to fall over when it’s full of gear and you put it on. A full backpack will never feel weightless, but it shouldn’t feel like torture, either. If roller bags are your choice, check out the suitcases from checkout the suitcases from Amazon. Looking for a kids’ travel backpack? Check out our kids’ carry-on luggage post. It’s great that you’re going to travel, and if you want your belongings with you all the time then you’ll need a travel backpack instead of the usual luggage bags. Travel backpacks may enable you to go on short hikes and camping trips, and you can decide to go to another city or country on a whim without too much preparation. So the question is, how do you choose the right backpack for you? 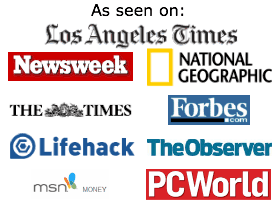 Before you buy any type of backpack, check out the travel backpack reviews from verified customers. This is especially crucial when you’re buying it online and you can’t personally check it out yourself. Of course, you’re going to read the specs of the backpack you’re going to get. You’ll need to look for features such as made from waterproof material, so that your belongings don’t get wet when there’s a drizzle. You also should get an internal-frame backpack, meaning that the frame and the support rods are already built in and hidden, instead of having separate rods that stick out. Internal-frame backpacks are slimmer so you can move around more easily, and usually the rods are made from tough plastic or carbon fiber that’s lighter and more durable. You may also want to get lockable zippers so that you can have some piece of mind regarding the security of your belongings or of your bag itself. While there’s not much of a risk that people on the road will pickpocket your dirty clothes, there’s always a chance that some baggage handler at the airport may take a liking for some of your things. A bigger risk is if you’re in a country where there’s a chance a police official can plant some drugs in your bag so that you’re going to have to pay up big time to avoid prison. You also need to see that there are enough compartments for your things. A separate compartment for your shoes is always a good idea, and if you’re bringing your laptop with you then that also needs a compartment of its own. You’ll also need to check that there’s padding on the shoulder straps so there’s less pressure on your shoulders and on the adjustable hip belt so that it’s more comfortable for you to support the weight. Most of the weight you’ll carry will be supported by your hips. One of the things you need to check out is the brand, of course. This isn’t about brand snobbery, but about going for the brands with the best reputation for producing durable backpacks that don’t break down soon after you buy them. This is where the travel backpack reviews come in. You can check out the long-term reviews and see that the straps are durable, the buckles aren’t flimsy, and the metal zippers are not prone to locking up. Some backpacks also have ventilation systems that keep the load off your lower back so your clothes don’t sweat through. However, you may have to sacrifice some durability in the material in exchange, because backpacks with ventilation may be more likely to get torn. Then finally there’s the size of the backpack. Some manufacturers have sizes such as small, medium, and large, but what’s large for one manufacturer may be considered medium by another. So first you need to measure your torso length (not your height) from the prominent bone at the base of your neck to the top of your hip bone. Then you can check the backpack specs that correspond to your measurements. The overall size of your backpack may also correspond to the length of your trip. The longer your trip is, the more things you’ll likely bring with you. Smaller is always better if you have a choice, so for a weekend trip a light backpack with a 35 to 50 liter capacity will be fine. For 3 to 5 day trips you may want a capacity ranging from 50 to 80 liters, and for extended periods you’ll need a minimum of 70 liters. There are some special considerations to factor in when buying a travel backpack for women, aside from the usual considerations. One crucial factor is of course style. It has to look good, and appearance is not something that most women will consider inconsequential. Men are also concerned about how “cool” a backpack is of course (most men don’t choose canary yellow backpacks, for example) but the standards of what’s cool may be different for women. Now one of the most important considerations is size, because women are on average smaller than men. It’s for that reason why most women choose backpacks in a size “medium” while most men go for the “large size” instead. Many manufacturers simply make a smaller size of backpack and call it a women’s version, but your best bet is to choose a backpack tailored specifically for women. They have to be designed specifically for the frame of a woman, which is different from a man’s frame in more than just size. The torso dimensions are on average shorter and also narrower. But the hip belts and the shoulder straps should be contoured with the woman’s form in mind. But the size must also be enough not just for the woman’s belongings, but also enough for her future belongings. In other words, it must anticipate the likelihood of shopping adventures, and these purchases must be accommodated. Of course, if a woman wants to avoid the temptation of shopping then a smaller backpack may be the best option. It’s much easier to decide not to shop when there’s not much space begging to be filled with various new items. A separate compartment for the shoes is important, and also a special compartment for umbrellas. Many guys are too cool to bring umbrellas, but most women have more sense than that. And also, a special compartment for makeup would be nice. Now let’s consider the straps. It must be adjustable, and not just padded for your comfort. When the straps are adjustable, the bag won’t sag down low like you’re some kind of teenager. Instead, you can tighten the shoulder straps so the bag can ride higher on your back. This prevents the backpack from pulling on your shoulders and causing you lots of discomfort and pain. A padded hip belt is also essential. Again, a lot of guys don’t go for this because they want the coolness factor of easily removing the backpack whenever they want. And again, women usually have more sense than that. The hip belt is crucial in making sure that the weight is properly distributed. The weight of the backpack is loaded more on your hips, as it was properly meant to do. When the hips are carrying the load, you have your most stable and strongest part carrying the biggest burden. This will greatly reduce the pain you’ll experience on your neck, shoulders, and back. Some people may also want an additional carry strap so that they can carry the backpack like a shoulder bag. You may also want a strap that connects across your chest between the 2 shoulder straps. This also helps in a more even distribution of the weight, and the strap doesn’t have to be padded because it’s not resting on you. You may also want to consider a front-loading backpack, especially when you think you may have to dig through your bag often to get what you need. A front-loading backpack can open as if it is a suitcase, so you can easily get the things that have fallen to the bottom of the backpack. The great thing about a backpack specifically designed for women is that they are also great for older children. Boys and girls can use them comfortably, although boys may not feel all that comfortable when it comes in lurid pink. There are many reasons why some people are adamantly opposed to the use of backpacks when going on a trip. People especially curse them when they’re in a line in an airport. They either have to carry the backpack on their back, and this can take hours. Or they can lay the backpack unceremoniously on the floor and kick it every time the line moves. Hoisting the backpack from the back is also quite uncomfortable for many, especially for women. It’s feels and looks awkward, and there’s really no graceful way to pull it off. The backpack straps are also a hassle when you’re worried about airport conveyor belts. There’s always a chance that the backpack would get ruined, and that will include the contents as well. Finally, having a backpack on your back can seem a bit unprofessional. For those who want to look a bit more dignified, there has to be a better way. And that better way is to get a travel backpack with wheels. The wheels make all the difference in the world, and your back and shoulders will thank you for if they can speak. Or perhaps they can—the lack of pain is their way of saying “thank you”. With the right kind of wheel, you can just lug your “backpack” everywhere: airports, malls, and on the streets. You may even be able to roll the backpack on nice footpaths in the park. And if the terrain isn’t conducive to your wheels, you can then just put on the straps and wear the backpack like a regular backpack. If you’re buying one, make sure you first make your decision with the factors important to any travel backpack. That means you need durability and waterproofing, enough compartments, and padding for the shoulder straps and hip belt. Now for the additional considerations. First you’ll want to get the best wheels available. They should be sturdy enough even for non-paved roads, and they should be securely attached. What you don’t want is to have to chase your runaway wheels, and dragging this backpack when the wheels are gone is going to be a drag. Then you also need to see that the additional parts such as the handles and the wheels are not putting some weird pressure on you when you carry it like a typical backpack. So the wheels shouldn’t be pressing on your back or hips, for example. The handle should be adjustable as well. The material of the handles and wheels should also be light as well as strong. There are times when you need to carry this bag, and you’ll want it to be as light as it can be. So if you’re trips don’t really involve a lot of hiking in the mountains, you really need to consider having this type of backpack instead. By now, you should know that there’s a big difference between a travel backpack and a backpack for trekking. This is especially true for carry on travel backpacks, which are compact enough for you to carry on board a plane. The bag stays with you all the time, so you won’t have to worry that it will end up being pawed through by unscrupulous baggage handlers. There are some airports in corrupt countries where this is actually a common occurrence. You’re also not worried about going to Europe while your backpack goes to Brazil. Stories of lost luggage are commonplace, but you don’t want to add anything to that discussion. Of course, there’s also the potential of having your luggage destroyed. You may be worried about the conveyor belts, but baggage handlers may be tossing your bags around. If you’ve got your good shoes inside, it may not be all that good afterwards. These bags are also very small, and that means your back and shoulders won’t feel too much strain during your vacation. You just need to make sure that it will fit in the overhead compartment. Most US airports require a bag that’s no bigger than 22″ x 14″ x 9. Some require that the overall dimensions should not add up to more than 45 inches. International airports may have different size and weight requirements too, so you better check that out. Have fun on your vacation, and hopefully you get the right travel backpack for your trip! There are numerous luggage options you can choose from when embarking on a trip or journey. For frequent travelers, choosing a decent piece of luggage is important. They can use it over a longer time period and not have to think about the luggage they would have to take each time. From suitcases to duffels, the options are varied. One of the best choices you can make is buying a travel backpack. Backpacks have for long been associated with hitchhiking and adventurous trips, yet they can prove to be just as effective on a business trip or for children flying alone. After all, it is about keeping your things safe, accessible, and being easy to carry. Backpacks have come a long way over the years. You will find considerable variety in the market, so much that it could become difficult for you to make a decision. Needless to say, you have to make sure you select the best travel backpack for you so that it lasts long and can fulfill your needs. You might still not be convinced about the option of taking a backpack with you while travelling as tote bags and miniature suitcases are options. That being said, there are several reasons why you should opt for a travel backpack over the others. 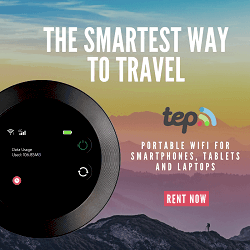 To truly enjoy the convenience and benefits a backpack offers when you are travelling, it is imperative that you opt for the best travel backpack available to you. First and foremost, it is extremely simple for you to store a travel backpack as compared to other luggage options. You can easily put your travel backpack in the overhead compartment on a plane or a train. It can go under your seat on the bus and won’t take much space in the trunk if you are travelling by car. The sides of travel backpacks generally are soft and can be cinched to fit into tight spaces. That being said, if your backpack is packed to the brim, it would be difficult for you to cinch it. Aside from that, there is no other piece of luggage you can store as conveniently. You wouldn’t find it difficult to carry your travel backpack for hours and hours. This is because the weight of the backpack and the stuff within is divided across your shoulders, back and hips. This way, the strain of carrying the backpack is evenly spread out, ensuring you don’t feel fatigued after carrying the backpack for a while. The best travel backpack brands focus on making their luggage ergonomically-friendly. This is why their backpacks are easy to carry. Moreover, backpacks have thick straps which have added padding on them to ensure they don’t ‘cut into’ your shoulders and back when you put the backpack on. Perhaps the most important advantage of buying a good travel backpack is that it would help you keep your stuff organized. If you are going on a long trip, it is possible you want to take a lot of items with you. Keeping them organized could be a hassle if you cannot store them properly. Backpacks have compartments for the smaller items and sections for the larger ones. Regardless of whether it is a plane ticket or a pair of shoes, your things remain organized and in one place. You don’t have to fret over getting all your stuff packed before leaving for your next destination or going home. Another great benefit of opting for a travel backpack is the portability it offers. There are few (if any) pieces of luggage you can move as easily as you can a backpack. Since you can wear it on your shoulders, you can easily carry it with you. This makes it simpler for you to get your luggage through crowded areas. All around, travel backpacks are easier to move around than rolling suitcases or totes. Lastly, the best travel backpack will surely be made of materials that are durable and weatherproof. This includes waterproofing as well. The things you keep inside the backpack remain safe. This is a great advantage if you are going to be staying outdoors most of the time. Backpacks have been considered ideal for campers. These are some of the reasons why opting for a travel backpack over any other luggage option is a great idea for you. As mentioned above, to make the most of your backpack, it is important that you know how to select the best travel backpack. In the next section, you will find some tips regarding selecting a travel backpack that suits your needs and preferences. What makes a travel backpack the best? There are a number of factors that you have to keep in mind. You can buy the most expensive backpack available on the market and yet it may not serve your purpose. It may be considered the best by experts but if it doesn’t fulfill your needs, you wouldn’t think of it as the best travel backpack, would you? First off, you need to ensure the backpack you select is made of weather-resistant materials yet is lightweight. You don’t want to be dragging around a heavy backpack just because it is 100% waterproof. Any bag that prevents the items inside from getting wet while being easy to carry around is good enough. The best option is to get a backpack that comes with additional tarps you can use in case of rain or snow. Next, you need to make sure that each compartment of the backpack has two zippers and more importantly, the zippers can be locked together. Security might not be a major concern when you are travelling outdoors but you don’t want insects and animals of the wild getting into your travel backpack while you are not paying attention. Any travel backpack that has a number of compartments is a good choice for you. As mentioned above, buying the best travel backpack helps you keep your stuff organized. For that, you have to buy one that has multiple compartments. The best backpacks on the market have several compartments, both big and small. Therefore, you can neatly arrange the belongings you want to pack in your backpack and keep them safe. This way, you won’t have to search your backpack every time you want to take something out. One of the most important factors you should consider is the location of the frame of the backpack. Gone are the days when travel backpacks with huge external metal frames were ‘in’. Now, the better backpacks are constructed with an internal frame. This way, the frame is hidden from view and tucked away inside the backpack. An optional feature that makes carrying the backpack easier is a hip belt. You can attach it around your hip to put more weight on your hips and reduce the burden on your shoulders. Generally, travel backpacks have adjustable hip belts which you can tighten or loosen as per your needs. Make sure the belt (if available) is padded so that it doesn’t dig into your skin. Talking about padding, you should reject any travel backpacks you see that don’t have padded shoulder straps. You have to keep in mind that the backpack is going to be on your shoulders for the most part. If the straps aren’t padded, it would be uncomfortable for you to carry the backpack around, especially if it is heavy. The thicker the padding, the better it is for you. The same goes for the back as well. The back of the backpack should be padded as well. After all, you cannot consider a backpack the best travel backpack unless it is comfortable for you to carry around. Having padding all around wouldn’t make it lighter but certainly easier to carry. Apart from these factors mentioned above, you also need to consider the size of the backpack. For instance, a backpack that is generally considered big may not be as big for you. The ideal size will depend on your height and body type. You may feel comfortable carrying around an 80-liter travel backpack, while some people struggle to put on a 40-liter one. The best way to decide is to actually put on the backpack. Only then can you judge whether or not it is the right size for you. If you are buying it online, it might be tricky for you to do so. In that case, you will have to see pictures and calculate dimensions before making a decision. Most importantly, you have to figure out the amount of money you want to spend on a backpack. It wouldn’t be the best travel backpack if you can’t afford to buy it. Therefore, have a budget in mind before you start looking for one. The general price range is $99 to $300 for the best travel backpack brands. You shouldn’t expect to spend more than $200 on a topnotch travel backpack. With extended warranties on them, they should last a long time. To make finding one even easier, let’s look at some of the best travel backpacks already available in the market. The Minaal Carry-on Backpack is quite the rage these days. The size of the backpack may be small, topping out at 35 liters, but that doesn’t mean it wouldn’t fulfill your needs. If you check out the online demo, you will see you can pack all the stuff you need while travelling in this backpack easily. Moreover, it comes with a rain cover. That being said, the Minaal Carry-on aims to be a one-size-fits-all backpack. There are no options in terms of size and since it is fairly new on the market, its durability is under a cloud. The Osprey Farpoint 40 Travel Backpack, Charcoal, Medium/Large is a great choice for people conscious about the size of their travel backpack. It is available in two different sizes, ideal for people of any height and size. In fact, if you are shorter than 5’3”, this is by far the best travel backpack on the market for you. The Goruck GR2 is as durable as durable can be. The price tag is heavy at $395, but this is one travel backpack that will last you a lifetime. It was originally designed to be used by the military and therefore has a rugged texture and appearance. This might make it uncomfortable to carry around over long distances but if you want to keep your belongings safe, this is the best travel backpack. The Timbuk2 Aviator Wheeled Backpack, Carbon/Carbon Ripstop, Largeis the perfect travel backpack for air travel. It can be taken on the flight as a carry-on. Moreover, it has the most padding of any other backpack you find on this list, making it the most comfortable of the lot. There is plenty of space available to keep your belongings as well. Oh, you also have the option of a Wheeled version or no wheeled. Rounding off this list, (AND MY PERSONAL FAVORITE) is the Condor 3 Day Assault Pack (Black, 3038-Cubic Inch) is the perfect size of the five backpacks on this list. This is a fantastic backpack for traveling that could be used for bush craft, hiking, or camping. This is a budget piece of gear, however, is one high quality and a well designed piece of gear. It is extremely light and has plenty of padding, making it easy to carry regardless of your strength and size. The main drawback is the lack of a compartment for your laptop but if you don’t usually take your laptop with you, this is the backpack you should go for. These are five travel backpacks on the market you can check out and choose from. Each one may have certain advantages but they are the closest in terms of meeting the criteria for the best travel backpack as outlined above. I love bags. They are perhaps one of my favorite (non-edible) things. So, when Kimberly told me Ivy Mountainsmith Recycled Backpack would be sending us travel backpacks for our 4 month South and Central America trip I was super excited. I chose the Mountainsmith Ivy Recycled pack in the green mist color. Overall, the Ivy by Mountainsmith Recycled Backpack is great. A sleek design and awesome color make it look amazing. But the folks at Mountainsmith clearly care about more than just looks. They’ve got the littlest details nailed. Carry-on size — need I say more? Technically it’s a little tall for a carry-on but that is only if you stuff it to the very top, so just don’t tell the folks at TSA. The Ivy pack at 32L has enough space for an extended trip (such as ours) but is small enough to use as a day pack. We’ve used it for several day trips where we’ve needed extra water, jackets, or extra room to store some Mendoza wine. Because you can only access this bag from the top it’s very secure. A thief would have to unstrap the top cover and undo two drawstring closures to get into this bag. That said, because it’s a top load only, it makes it a little difficult if you’re looking for a pair of clean underwear at the very bottom of the bag. What amazes me most about this backpack is the straps. The shoulder and waist straps are super padded. And, if you’ve ever had a large pack you know that when you tighten these straps the excess tightening strap hangs down. With the Ivy they’ve included small elastic loops to tuck the excess strap into; this keeps it looking clean and prevents tangling. Another difference between the Mountainsmith Ivy and other backpacks I’ve used is the fabric — it’s flexible. So, when I stuff my fleece and rain jacket into the bottom the fabric gives. Overall, the Mountainsmith Ivy is a really great pack. It would be perfect for a weekend trip or anyone with lots of stuff to strap to the bag (such as skis or ice picks). It is also great for longer haul backpackers who don’t need a lot of outside pockets. If you’re looking for a backpack with a lot of pockets check out the Lily Mountainsmith backpack review. The one thing that’s missing for me is somewhere to put my water bottle (besides on a carabiner) so it’s easily accessible, but its other features make up for that. Oh, and did I mention Ivy by Mountainsmith Recycled Backpack made out of recycled materials? Amazing. When we decided to backpack through South America, I knew I didn’t want to haul around the ginormous pack I used to travel Europe. I wanted something more compact. It was time to find a new pack…the Lily recycled backpack by Mountainsmith! I did some research into greener options and was surprised by the lack of backpacks made of eco-friendly materials. After all, backpackers and hikers are very much outdoorsy types who care about the environment. So I was psyched when I found Mountainsmith’s line of recycled packs. The folks at Mountainsmith were kind enough to send me a Lily backpack made of recycled PET. It’s the perfect size for extended travel if you pack light, though it’s designed for shorter trips. And it’s carry-on size, which was a huge selling point for me. Its 31.5 liters hold more than you’d think and at just 2 lbs 8 oz, carrying it is a breeze. It works well as a day pack, too. My favorite part is the pockets. The pockets on either side are big, and the front compartment has lots of smaller pockets to help you stay organized. There are even two water bottle pockets large enough to hold my 24 ounce water bottles. The shoulder and abdomen straps are extra padded for added comfort. The Lily recycled backpack by Mountainsmith pack is designed for women and it fits me better than most unisex pack do. It even has a safety whistle, which I’ve fortunately never had to use, and can hold trekking poles, a sleeping bag, and an ice axe. All in all, the recycled Lily recycled backpack by Mountainsmith is a great pack for anyone who’s looking for a small pack for extended travel, or a large daypack, and I applaud Mountainsmith for leading the way with eco-friendly backpacks. I would definitely recommend the Lily to any green traveler. How to make sure you’ll be safe and comfortable while minimizing the ‘faff’ factor. Essential Backpacking Tips and Items to Pack for your Backpacking Adventure. That backpack, the home-in-a-bag, is a complex organism, deeply personal yet highly practical. Yet it needn’t be an unwieldy burden, and indeed you will greatly benefit from ensuring that it is as efficiently and comfortably packed as possible. This is not inherent knowledge. This is something that needs to be researched. For starters, you need the right backpack. Think 30-50 liters backpacks for a weekend trip. 50-80 liter backpacks if you’re going for four or five days. If it’s an extended trip you should consider at least 70 liter backpacks – all depending on your own size and strength. Make sure you try it out a couple of days before your trip, because you may need to rethink the contents – or the bag. To make it as comfortable as possible and to ensure that the weight is distributed in a manner that your back will thank you for. Put your sleeping back in first, followed by your provisions and cooking gear. Your clothes can pad around this at the top and sides, with your maps and snacks in easy reaching distance at the top. Remember to keep anything else that you might need urgently – your papers, medication, phone – in an easy-to access place, too. You don’t want to find yourself completely unpacking and repacking your things in the desert because you can’t find your inhaler. In among that comforting food and bedding, of course, you will need to pack some necessities more specific to the backpacking experience. Backpacking can be dangerous, and ensuring that you, your comrades and nature itself survive the experience intact requires awareness both of predictable dangers, and the unexpected. A first aid kit is a must. No matter how careful you are, your hike is likely to take you far from organized medical aid. You need to be responsible for your own falls, sprains, burns and bites as well as on standby for your fellow trekkers. Likewise, you might not yet foresee how you could possibly use a Swiss army knife, despite its apparent utility. But you’ll be grateful for it when you least expect it. And while the army knife may cut, lever or screw things apart, you’ll value a trusty roll of duct tape for sticking everything together from torn clothing and tents to impromptu plastic bag boots. Now, a word about finding your way. GPS or SPOT Satellite Messanger is a godsend. Prep your phone or other device and estimate your battery expectations. Pack a portable charger if you can. But don’t rely purely on GPS as there are a number of things that could go wrong – especially in the poorly mapped wilderness. Instead, take back-up in the form of an old-school map and compass, things that don’t rely on power or connectivity. And never assume that you know the terrain. Make sure to time your trip, so you know when to turn around and head back. Tell someone else where you’re going before you leave so they’ll know to raise the alarm should you be late. Take a whistle with you so you can signal for help should the need arise. If you do get lost, stay calm. Make your way to higher ground if possible, which will hopefully offer you a fresh perspective on what’s around you. Maybe revealing a familiar landmark that you previously passed, and to which you can retrace your steps. But if this doesn’t work, and there’s no immediate danger, it’s best to stay put. Wandering further on can just make you even more lost, guide you towards potential dangers, and make the trail harder for rescuers to trace. Make yourself a shelter, be it against the sun or the rain, and build a fire to maintain your energy and as a signal to rescuers. When you do hear a helicopter tracing the area, lay down flat on the floor (outside of the shelter!) so that you are easier to spot. Wear your brightest clothes, and if possible make a flag out of your most colorful item. All that said, with the right preparation and a responsible attitude, disaster is highly unlikely. Most of your energies should be focused on looking after yourself, and nature around you. Be sure to eat regularly – a carb-packed oatmeal breakfast, a high-calorie lunch, and plenty of snacks in between – and drink plenty of water. You’ll want to take a water filter or purification tablets to ensure that even when your own supply runs out, you can make a healthy resource of any spring you should find. Remember to wrap up your trash and take it with you, and leave your souvenirs behind. Nature belongs where you found it! Fine wilderness will remain an enticing challenge for generations to come. These tips and more have been gathered into a great new infographic, an easy reference check-list for the aspiring backpacker. Be sure to study it closely and run through it ahead of your next big trip, like Best UK Walking Cycling Holiday, take care out there, and have fun. Whether you are packing your kids off to summer camp, getting ready to pack them off to college, or packing yourself off to a much deserved vacation, the rolling duffel bag is your new best friend. The perfect pairing between the flexibility of a duffel bag and the ease of movement of roller bags can be found with just the click of a mouse. These bags are big enough to act as a footlocker but their collapsible nature makes them easier to store than traditional suitcases and their flexible exterior can be squished or squashed down if space is at a premium. To help you get packing, here are the best rolling duffel bags according to Amazon’s reviews and ratings. Leading the pack is this super-sleek duffle that looks like the kind of luggage James Bond would use. With side panels that collapse for easy storage and a super strong exterior made from TuffLite™ fabric, you truly get the best of both worlds. Inside you will find more than 5,000 cubic inches of capacity, zippered dividers, pockets, and zippered pouches, providing all the space and organizational assistance you need to pack for a 10-12 day trip. In addition to wheels specifically designed to roll smooth and quiet, this bag features tilt-resistant front feet which means no more awkward balancing act at the airport counter while you try to keep your suitcase from toppling over onto your feet during check-in. This bag is available in sunset (dark red) and rain forest (deep green), and is on Best of the Best List. It doesn’t matter if you are headed for the sea, the shore, or the slopes, this bag will have you covered. Constructed from a durable polyester blend, it has a pop-up feature that keeps the body of the bag upright while you are packing which saves time and maximizes how much the bag can hold. This duffel comes in three sporty color combinations, black/red, black/orange, and black/yellow, and collapses for easy storage under a bed or on a closet shelf. The most traditional of the three bags, the Tommy Bahama Nassau duffel (see it here) is a high quality piece made from durable two tone bird’s eye material. It provides numerous inside storage pockets and pouches and smooth running wheels for ease in moving around the airport or hotel. Designed to give you an island feel and get you in the mood for rest and relaxation, this is the perfect duffel for a lengthy cruise or trip to the Caribbean. Available in black and deceptively roomy, this bag can find a place in any vacation destination. Although smaller than the other featured duffel bags, this bag has a personality all its own. Made from cotton featuring the Lighthouse design, this duffel would be as easy to carry as it is to pull. The vintage fabric, designer hardware, and intricate quilting all combine to create a truly unique piece of luggage. Accented with interior and exterior pockets, there is plenty of room for a week’s worth of necessities and any new treasures you find on your trip. Backpacking with a toddler or baby – Backpacking with a toddler or baby? Yes, we have done it. Before and during our first few family backpacking trips with our very young children, we received our share of criticism, as well as downright bafflement. Not masochists, we assured them. Does backpacking with a toddler or baby come with its share of challenges? Definitely. Is it easier when kids are older? But exposing children to camping trips early makes for tougher, stronger, and happier outdoors men and women as they reach school-age. Read on for our tips and experience with backpacking with a toddler or baby. It may seem that a single night out would be the safest bet with a baby in tow, but consider the amount of energy, equipment, and preparation a backpack trip will take. Once you’ve packed and prepped for one night, you might as well stay two as all you’ll need is slightly more food and clothing. Plus, the first night of any type of travel with a baby is the toughest. Camping with a toddler or baby is no exception. Why pack up and leave just as baby has adjusted? Preparing for, executing, then returning from a single night family backpack trip will feel exhausting. Returning from a two night stay will feel… well, still exhausting, but at least satisfying as well! It’s possible you’re used to hiking much farther than 3-4 miles on a backpacking trip, but while backpacking with a baby or toddler, don’t tackle too much. This is not just because of baby’s short attention span. You must consider the extra weight the adults in your party will be carrying. You’ve certainly already taken the weight of the actual baby into consideration. Someone will be carrying him or her, but because of this task, someone else will be carrying more supplies than they’re probably used to. You’ll need to divide all the equipment, food, and other supplies among one less pack than your party is used to. If you backpack with two adults, one will be carrying the bulk of the equipment while the other carries the child. Remember, you’ll also be packing out more trash and/or laundry in the form of dirty diapers. Trust me, never has choosing the proper backpack been more important! You will need at least two: one for your things and one in which to carry your child. To have an enjoyable time backpacking with a baby, you must have a child carrier backpack that meets your needs. We love the Kelty Journey because it has just the amount of bells and whistles we need, and no more. Includes a sun and rain shade for baby — this is so important! If you have a toddler who would rather walk, decide ahead of time how much of the trail you’ll let him or her navigate. Let him or her know well in advance when it will be time to be carried again. We bartered deals of about quarter mile walking, one mile riding. It’s slow-going, but as you hike, you realize you’re instilling a love for the outdoors in your child, making it worth it. Having the right child-carrier backpack is essential for backpacking with a toddler or baby. Camping near a water source is more important now than ever. Spare yourself the extra weight of carrying in fresh water, and use a filtration system or water purifier in tandem with a stream or lake. It’s also nice to have a ready water source for bathing your child, or playing in if the weather warrants a swim. Make sure your camp is free from irritants like poison oak if you have a walking child, and is as level as possible. We loved feeding our baby in his propped up backpack as an impromptu high chair, but this only worked on level ground. A good campsite is essential when you’re camping with a toddler or baby. If you have a toddler, consider putting a small bell on his or her shoelace. Yes, it’s a bit irritating, but we only used this technique around the camp site, where it would be easy for our children to wander. Show older children your site’s boundary (set by you!) and teach toddlers to stay away from cook stoves and fire pits (this is easier said than done, but we enforced it early and often). With active toddlers, it can be a good idea to set up your camping kitchen well away from the “living” areas of camp, despite the inconvenience. Create and carry a comprehensive wilderness first aid kit, and be sure it contains stand-bys such as baby aspirin, Benedryl, and baby-friendly insect repellent. Make sure the kit is small enough to easily carry with you, and bring into your tent at night. During one memorable backpacking trip, our 18-month-old developed an ear infection. No fun for anyone, but having Tylenol helped until we were able to pack up and return home. Plan to sleep with your child in a tent large enough to accommodate your family and give your child the appropriate amount of space for safe infant sleeping. We began packing in two tents when we started backpacking with our kids (one of which was a larger 3-person). The extra weight was worth the extra space at night. Make sure your baby or toddler has their own space in whatever tent you choose, well away from loose sleeping bags and pads. Putting our baby to bed in a baby sleep sack worked well for us. Have you gone camping with a toddler or baby? What backpacking tips do you have to share? Read about our experience backpacking South America for more tips. Photo credit: Sean Dreilinger and Tubby. – Front loading, traditional top-loading packs are a pain to pull things in and out of. And I am jealous of people with front loading packs that lay it down unzip and have access to all contents in 30 seconds. – Lockable, my pack has so many openings it is impossible to lock, and while we have not had a problem yet, you end up leaving your pack in hotel luggage rooms unattained all the time and I am more worried about someone putting something illicit in before we head to an airport, vs stealing some of my dirty clothes. – Tough material, the pack I have is very lightweight but as such it is much more vulnerable to abrasion and the abuse of getting through under buses, on top of vans, through airports and such. Hope this advice helps someone else looking for a good RTW pack. As another thought if you are starting your trip in SE Asia, bring your stuff in a cheap suitcase you have and buy a knock off pack here for about 1/6th the cost of what they are at REI. @Andy – That’s a good question, too. Thanks! @Keith – Thanks for sharing your experience and those tips. I would definitely vote for a front-loading backpack for a long-term trip. I brought one to Argentina and it was perfect. And lockable is a really good feature to think about, too. Thanks for sharing these useful tips. I would have called it Ten commandments if there was one more tip. 🙂 I have read Ultimate Guide to Packing Light as well. This would definitely help me next time. Last year I had bought my backpacks online from Bergman Luggage and since most of these parameters like size, weight, material were mentioned on site so it was easier to choose my bag. Nice that you mentioned all these tips here in separate blog, it’s very informative. Great tips for avid backpackers. I love the idea of backpacking, but I know carrying a heavy rucksack on me all the time is not going to do good things for my back. So, a rolling bag + daypack combo is what I would go with. In fact, one of my latest purchases has been a travel backpack from Briggs & Riley. For my next trip, I am juts going to dump the rolling bag in the hotel and carry everything I need for a day trip in the backpack when I venture out. Have you every seen or used one of those Ivar backpacks with their internal Shelving System? Ivar’s benefits are (1) ergonomic weight distribution via several internal (angled) shelves (thereby not allowing for all your cargo to fall to the bottom), and (2) file-like organizational access to your stuff. Great article! On my recent trip to Central America to volunteer with Humanitravels I decided to economize on a backpack. 3 weeks later and the top is already ripped. My previous one lasted for 3 yrs so the lesson is, invest! It’s the most important piece of travel gear.